One of the seminal events in the shaping of pioneer Nevada was the Pyramid Lake Indian War of 1860. The conflict was the result of a volatile cocktail of ignorance, misunderstanding, anti-Indian sentiment, and miscalculation. The roots of the war can be traced to the massive influx of white settlers through the region that would become Nevada after gold was discovered in California in 1849. The situation was exacerbated when large numbers of whites settled in the state following the discovery of silver in the Comstock area in 1859. The new residents immediately began to take advantage of the area’s resources—digging holes to find the valuable ore, cutting down trees for fuel, damming streams, hunting available game and cultivating the land. The problem, of course, was that these actions severely affected the quality of life for the region’s earlier inhabitants, the Washoe and Paiute tribes. For instance, the trees provided nuts that were an important food source. The fact that natural resources are so limited in the harsh Great Basin region only served to heighten tensions between the settlers and the local peoples. 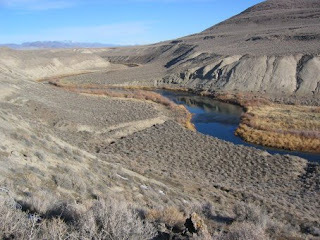 The actual battle was finally triggered in May 1860 after two Paiute women, who had gone hunting for pinenuts, were kidnapped and held at a place called Williams Station, located on the Carson River, near the present day Lahontan Reservoir. The crime was discovered by local tribal members, who rode to the station to free the women. A skirmish ensued, during which four white traders were killed and the station was burned. Despite the circumstances, word spread quickly that the Paiutes were on a rampage. Within days, the story had been so exaggerated and distorted that many Virginia City and Carson City residents believed that an army of Paiute warriors was heading their way to massacre them. Three days after the Williams Station tragedy, a 105-member volunteer citizen militia had formed—led by Major William Ormsby of Carson City—and set out to seek revenge against the Paiutes. The army was untrained, undisciplined and ill-equipped—but arrogantly confident they could easily defeat the Indians. The motley group first headed east to Buckland’s Station (near present day Fort Churchill State Park), then seven miles to the site of Williams Station. After burying the dead, the group continued north to the present day site of Wadsworth. On Saturday, May 12, the militia members awoke to find the ground covered with several inches of snow. Despite the weather, the group packed up and moved north along the Truckee River toward Pyramid Lake. At a point about a half-mile north of present-day Nixon, the army spotted a cluster of Indians on a bluff above the river. The militia split into two groups, with about 30 men giving chase to the Indians. Once atop the bluff, however, the smaller group found itself surrounded by warriors. After trading bullets, the militia members were driven back to the meadows below. Meanwhile, another group of Paiute warriors circled to the south of the militia, effectively cutting off any possibility of retreat. At this point, the trap—devised by the Paiute’s war chief, Numaga—was set. Militia members found themselves surrounded by warriors, mired in the muddy gulch. Despite repeated efforts to charge out of the gully, the volunteers were pinned down. Two hours after the battle began, it was effectively over. Historical records indicate that about 75 of the 105 militia members, including Ormsby, were killed. Following the disastrous May 12 encounter, a more formidable army of 800 white combatants gathered, which included trained soldiers. On June 2, 1860, this force engaged the Paiutes south of Nixon. This time, the army broke the Indian forces. The Paiutes suffered many casualties and scattered after the skirmish. Within months a treaty was negotiated and the Pyramid Lake Indian War was over. The federal government responded to concerns about any future conflict by erecting a series of forts in Nevada, including Fort Churchill near Silver Springs (now a state park). It's still possible to find the location of Nevada’s most famous war. The terrain, in fact, is the largely the same as described in historical records. The Truckee River winds through narrow, flat river bottomland—now largely used for ranching and recreation. Steep, eroded cliffs and hills rise above the river on both sides. Standing on one of those hills, adjacent to State Route 446, it's easy to look down on the site and imagine how it unfolded. One can imagine the fear and anticipation felt by members of the volunteer army as they marched down the center of this gulch, searching for any movement in the deep shadows of the uneven cliffs and hills. In other words, an ideal place for an ambush. The Pyramid Lake Indian War site is located about a half mile north of the community of Nixon. An excellent resource booklet for anyone interested in exploring the sites of either of the Pyramid Lake battles is “The Pyramid Lake Indian War,” by John Townley. The 24-page guide, which is still in print, includes historical information as well as maps and instructions for finding the actual battlegrounds. Additionally, “Sand in a Whirlwind” by Ferol Egan (University of Nevada Press) is an accurate historical retelling of the circumstances that led to the war. One of the most scenic drives or hikes in Western Nevada is a trek on the old Virginia and Truckee Railroad bed that runs parallel to the Carson River, just east of Carson City. The best way to access the railroad bed is via Deer Run Road (located off U.S. 50 East). 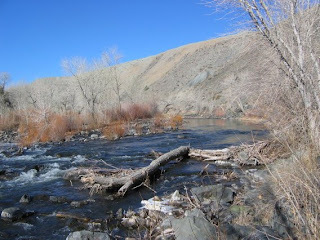 Drive about a quarter mile to a bridge, then turn left on the dirt road adjacent to the Carson River. The road is fairly good, although a four-wheel-drive vehicle is necessary in a few places because of mud and large rocks. The road is also popular with mountain-bikers. At the start, it takes a few twists and turns and passes a gravel plant. Just beyond the gravel business, turn left on a slightly rougher dirt road and you’ve reached the old V & T pathway. Cottonwoods and thick foliage line the river, which has plenty of flow in the winter and spring. The road hugs the hillside above the water and affords several photogenic views, particularly of the rushing water and trees (which are beautiful in the fall when the cottonwoods are clothed in yellow leaves). About a quarter-mile from the starting point, the road passes a small hill with an unusual concrete vault or room (it looks like a tunnel) built into its side. Just around a curve from the hill, the road crosses a wide flat and to the left are the remains of an old mill. During the 1860s, several mills were constructed along the river to process ore from Virginia City’s mines. The ruins consist of a few stone and concrete walls, some metal scraps and lots of trash of more recent vintage. The ground around the site is littered with broken glass and gun shells (it’s a popular local shooting range). From this point, the road begins to slowly climb and the views become more spectacular. Below, the river winds through the narrowing canyon, which is lined with multi-colored cliffs. In some spots, the walls are craggy and gray, covered with brilliant green lichen, while in other places they are painted in rich shades of red and brown. There is the smell of damp sage in the air and the sounds of life accented by chattering birds and the rapidly rushing waters of the river. The route grows more rutted and rocky as it continues its upward path, away from the river. Near the highest point, it enters an extremely narrow pass, which is partially blocked by large rocks. It is, however, passable if you’re careful. From this point, the route turns north into Mound House passing through a housing subdivision before rejoining U.S. 50. For those wanting to take a nice hike along the river, there is a portion of the old railroad bed that was actually a spur line, which can be accessed near Mound House. This trail (which is not drivable) goes east along the river to the site of the historic Eureka Mill. Occasionally, the old bed has been washed away so it’s a bit like playing detective to follow the route. Along the way, you can find the stone foundations of bridges that once spanned several wide gullies and evidence of wooden trestles that once jutted from the rock walls. In some places, the railroad bed was supported by carefully fitted, stone walls, which still look solid enough to use. At the mill site, you can find a few stone and brick walls while the grounds are littered with rusted metal shards and pieces of brick. And, of course, plenty of history. Western Nevada has become so urbanized over the years, that it’s hard to believe there’s a sort of ghost town in Washoe Valley. Granted it’s not as large as Bodie or Rhyolite, but hidden at the north end of the valley are a few remnants of a place called Washoe City, once the largest community in Washoe County. In 1864 Washoe City was a thriving hamlet with more than 4,000 residents. It had several lawyers and doctors, shops, restaurants, saloons, stables, a newspaper—the Washoe Times—and a post office. The town was so successful that when Nevada named a territory in 1861, Washoe City was named seat of the newly created Washoe County. The town’s beginnings can be traced to the rich silver discoveries in the late 1850s in nearby Virginia City. Because the valley had abundant trees and water, it quickly became a major supplier of both to the Comstock mines. By 1861, Washoe City emerged as the center of commerce for area sawmills and farms. The town also provided services for several quartz mills that were constructed in the area to reduce the ore mined in Virginia City. Within a short time, dozens of freight wagons began traveling daily between Virginia City and Washoe City. The wagons would be filled with food and timber on the way up to the mines, then return brimming with ore to be milled. In 1863, an impressive brick county courthouse and jail complex was constructed in Washoe City, which by then also had a one-room school, small hospital and two large meeting halls for the Masons and Odd Fellows. Unfortunately for the town, the glory years were short-lived. In 1866, the infamous “Bank Crowd” assumed control over most of the Comstock mines and immediately shifted milling operations to company-owned facilities along the Carson River. Additionally, timber companies had exhausted the supply of trees on the west side of Washoe Valley and had moved on to the thickly forested slopes around Lake Tahoe. The result was that Washoe City’s quartz mills and sawmills were no longer needed. The community’s decline accelerated after 1872 when the Virginia and Truckee Railroad was constructed and linked Virginia City to Reno. The train route passed through the center of Washoe City, but meant the end of the freight wagon business. 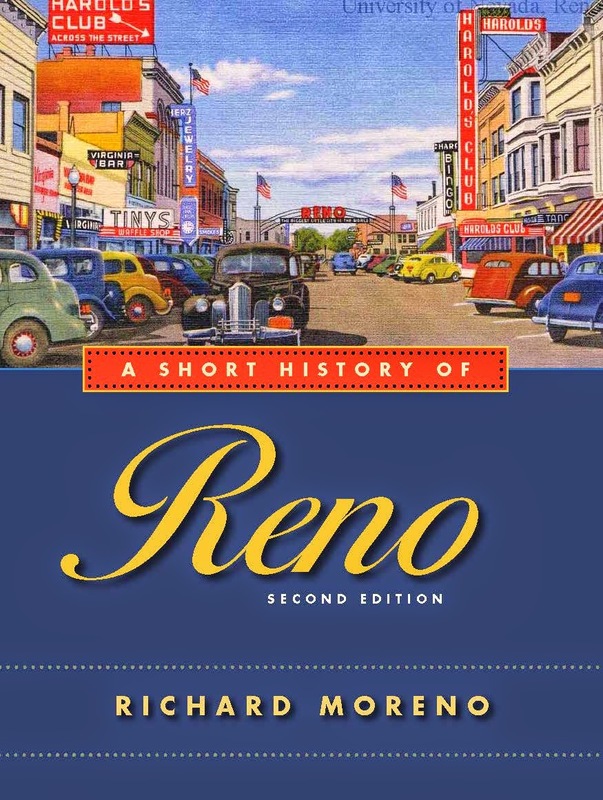 Not surprisingly, Washoe City’s troubles coincided with the rise of Reno. Founded in 1868 by the Central Pacific Railroad, the town quickly became Northwestern Nevada’s most important shipping terminus. In mid-1868, Washoe City’s newspaper had pulled up and moved to Reno. Less than two years later, the citizens of the county—who now mostly lived in the Truckee Meadows—voted to relocate the county seat to Reno. Washoe City supporters unsuccessfully appealed to the courts to overturn the election results, but in May 1871, the Nevada Supreme Court ruled the transfer was legal and appropriate. Angry at the loss of the county seat, Washoe City residents, now down to 800, attempted to secede from Washoe County. They petitioned the Legislature to move Washoe Valley into Ormsby County, but the effort failed. The town simply dwindled away during the next few decades. The courthouse was dismantled in 1873 (its bricks were reused in Carson City) while the magnificent two-story Masonic Hall was abandoned in 1888 and later collapsed. Ditto the Odd Fellows Hall. Today, Washoe City is largely gone and forgotten. Perhaps the most substantial structure still standing is the stone and brick building adjacent to a real estate development at the north end of Washoe Valley. About two-thirds of this building is original (the brick wall on the north side is new). 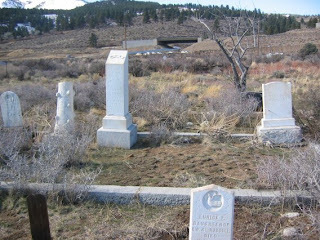 The other significant survivor is the Washoe City cemetery, located adjacent to the Cattlemen’s restaurant on U.S. 395. Here, you can wander through a surprisingly large burial ground containing several dozen marble and wood tombstones. For more information about Washoe City read “Boom Times in Old Washoe City, Nevada,” by the late Myra Sauer Ratay, which is available from the author’s family through a web site, http://www.ng-tek.com/genweb/grresearch/MyraBooks.html. Ratay was also author of another book about Washoe Valley entitled, “Pioneers of the Ponderosa: How Washoe Valley Rescued the Comstock,” which is also available from the same web site.